The Swimfin is possibly one of my best buys ever, I bought this for my 6 year old daughter who used it for half a day and could swim. I was amazed at how quickly she learned to swim and how her confidence grew. The swimfin is still being used to help her with her technique and I would strongly recommend this item to anyone with children who are learning to swim. My son is confident in water but not yet able to swim. This has given him the push he needed and he is excited to be off on his own. I imagine the "shark" fun factor will continue long after he can swim unaided. Fantastic product. The results were immediate. Position of body in water and ability to move arms without restriction. My daughter still needs to use it to build on strength but she is now much more confident and having fun! The SwimFin has recently been endorsed by the Amateur Swimming Association in the UK and is the only swimming aid to win their approval'. For beginner swimmers, the body is lower in the water causing the SwimFin swim aid to be more submerged which gives the swimmer more uplift and support without the arms being restricted. As confidence grows and body position improves, the SwimFin float appears more out of the water and therefore provides less support. At this stage of the swimmers progression arm floats or other swim aids would be reduced, SwimFin swimming aid does it automatically by working with the swimmers natural ability but also giving immediate support if required. In a horizontal position the SwimFin learn to swim float is virtually out of the water giving very little or no support, however the swimmer knows the support is there if needed. 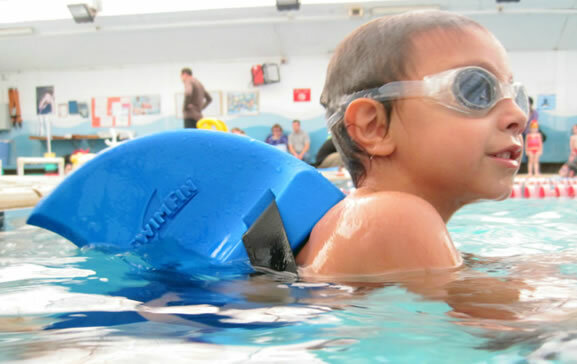 SwimFin is also great for swimming on the back, the learner simply leans on the SwimFin. Suitable for child's weight 33-66lbs. 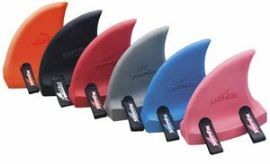 SwimFin is the first truly new development in swimming aids for decades. SwimFin makes learning to swim fun, but even after it has done its job as a learning aid, it will always find use as a water toy, strengthening ability and building confidence. Worn on the back, it does not hamper or restrict the ability to move in the water. It attaches to the swimmers back with two velcro straps, one under the arms and the other round the waist.